(CNN) -- Every dog has his day, but Sir Lancelot -- or at least his carbon copy -- has a second one. 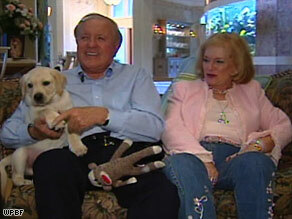 Edgar and Nina Otto show off 10-week-old Lancey, a clone of "the most human of any dog we've ever had." A Boca Raton, Florida, couple paid a California firm $155,000 to clone their beloved Labrador retriever, who died from cancer a year ago. The clone, a 10-week-old puppy dubbed Lancey, was hand-delivered to them earlier this week by Lou Hawthorne, chairman of BioArts International, a biotechnology company. "One minute with Lancey and you know he's special. He's both extremely aware and very sweet," Hawthorne said in a BioArts statement. Edgar and Nina Otto said they began thinking about cloning Sir Lancelot about five years ago. "I said 'Well, you know, it wouldn't hurt to have his DNA frozen,' and that's what we did," Nina Otto told CNN affiliate WPBF. The Ottos were one of five families to bid and win a BioArts auction for a chance to clone their family dog, according to a BioArts statement. Lancey is the world's first commercially cloned dog, the company said; the Ottos are the first of six current clients to receive their clone. Sir Lancelot's DNA sample was sent to the Sooam Biotech Research Foundation in Seoul, South Korea, which provides cloning services to BioArts. Researchers there put the DNA into an egg, and Lancey was born November 18, according to BioArts. The Ottos said they have had many beloved dogs over the years -- and have nine others currently -- but maintain Sir Lancelot was special. "Sir Lancelot was the most human of any dog we've ever had," Edgar Otto said in the BioArts statement. "He was a prince among dogs." For its part, the Humane Society of the United States says it's against the commercial cloning of animals. "Given the current pet overpopulation problem, which costs millions of animals their lives and millions in public tax dollars each year, the cloning of pets has no social value and in fact may lead to increased animal suffering," the organization said on its Web site. "For those looking to replace a lost pet, cloning will not create an animal identical to the one who is gone; cloning cannot replicate an animal's uniqueness. Cloning can only replicate the pet's genetics, which influence but do not determine his physical attributes or personality." The Ottos, however, said replicating Sir Lancelot's genetics is enough for them. Edgar Otto said he realizes Lancey might not be just like their departed dog, but "if he's different, we're not going to love him any less." Edgar Otto is the son of the late Edwin Otto, who was part of the founding of NASCAR and a "motorsports pioneer," according to www.ottomotorsports.com.